Upenders (UPD) provide controlled 90-degree work positioning in heavy industrial applications, including engine block manufacturing, die, coil, and mold handling, and palletizing. Heavy duty steel construction with a chemical-resistant powder coating provides long service life. Two steel tabletops meet at a 90-degree angle in the center of the unit, allowing users to easily tilt objects from sideways to upright and back again, thanks to dual-action hydraulic cylinders. 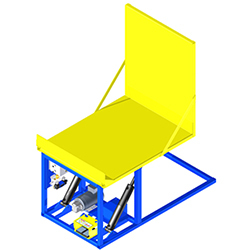 The Upender’s hydraulic system is located within the frame of the unit, keeping the footprint as compact as possible. With load capacities of up to 4,000 pounds, these positioners have the strength to handle some of the largest and most unwieldy objects in the manufacturing industry. Upenders are a favorite among manufacturers of heavy equipment engines, aerospace components, and coiled materials, for instance. They provide precise control over the position of the objects, allowing assembly staff full access without resorting to awkward, risky postures. Many users prefer Upenders for palletizing and de-palletizing tasks. While these units aren’t self-leveling like the Pallet Carousel & Skid Positioner, they do allow staff to gradually tilt pallets toward them for manual pallet-building or unloading. This limits the bending and stretching commonly associated with both pallet-building and musculoskeletal disorders. To learn more about Upenders and other material handling solutions from BHS, or to find a dealer near you, call the sales team at 1.800.BHS.9500.